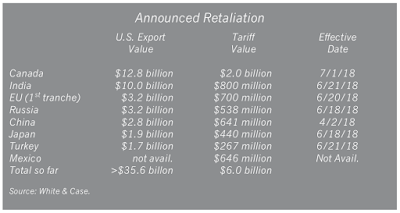 The Trump Administration is proving itself to be a bit of a bully when it comes to international trade, provoking even its largest trade partners to respond to the imposition of tariffs by the United States, most particularly on steel and aluminum. While Donald Trump has stated that trade wars are easy to win, in actuality, the battle is not always won by the party that started the war. 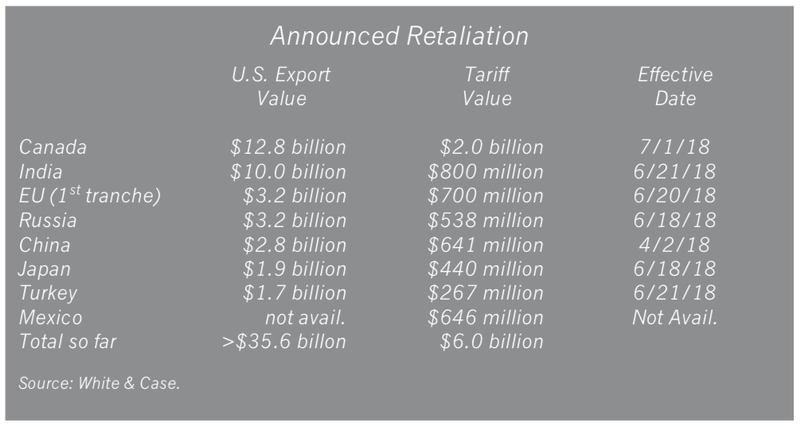 A recent Policy Brief by Trade Partnership Worldwide takes a close look a the impact of the 10 percent tariff on aluminum and the 25 percent tariff on steel, both of which were recently imposed on Canadian, European and Mexican products as their exemptions expired. It is these retaliatory measures that are going to have significant and unintended consequences for the United States and its workforce. The biggest job gains will be made in the steel and iron sector (+23,424), however, these are far outweighed by job losses in trade and distribution (-98,088), construction (-63,930), personal and recreational services (-35,033) and business and professional services (-26,590). Other services will also see a decline of 128,102 jobs. Service sectors are the hardest hit because, as consumers reduce spending when they are hit with higher costs (i.e. more expensive appliances, vehicles), they reduce spending on services such as entertainment and healthcare. It is interesting to note that job losses in steel-consuming sectors, many of which provide jobs to workers living in the Rust Belt and southern regions of the U.S. will see annual employment declines of 97,614 jobs in the first one to three years that the tariffs and their accompanying retaliation measures are in place. As you can see from this analysis, trade bullying does not always produce the desired results, in fact, sometimes the boomerang effect produces a very negative and unanticipated impact. In this case, the Trump Administration's imposition of tariffs would appear to lead to a significant number of job losses in states already hard-hit by America's long-term de-industrialization. Politics has always been about slogans and sound bits: Comprehensive analysis puts people to sleep. However, my response to every politician who stands at the lectern and tells me they have the answer to all my problems, is this: "If it was as easy as that, it would be done by now." The people at the top have a buffer if anything goes wrong. The people at the bottom, not so much or not at all. I suppose we complain about any politician in power, but Trump is quite unusual.